Now that we're in December, it's time for Christmas content galore! To keep the festive tradition going strong, this week's author interview is suitably themed. Today is my stop on the blog tour for the wonderfully magical Bells and Bows on Mistletoe Row by the lovely Emily Harvale. Emily was kind enough to take some time out from her Christmas shopping to sit down for a chat with me about all things festive! So, pour yourself a hot chocolate, sit back and enjoy! I’ve written since I was a little girl. I won several awards at school for my stories. My first prize was when I was about seven. It was a beautifully illustrated copy of Pinocchio – which I still have somewhere... I hope. My career took me on a very different path though. I returned to writing, seven years ago. Tell me about Bells and Bows on Mistletoe Row. It’s a light-hearted romance set at Christmas and the week before the Big Day, and it’s about friendship, family and falling in love. It’s also about second chances, misunderstandings, and the magic of Christmas. What’s your favourite thing about the festive period? Oddly enough, I’m not a huge fan of the day itself. For me, it’s the build-up to Christmas Day that’s exciting. The Christmas traditions – old and new. I love all the sparkle. I adore the Christmas adverts on TV; the mass hysteria in the shops; the frosty mornings. I long for snow – but I live on the south coast (East Sussex) and we don’t get much these days. How will you be spending Christmas this year? I’ll be spending time with friends, up to and including Christmas Eve. Since my parents died, I spend Christmas Day on my own. That shocks many people but I absolutely love it. As I said, the day itself isn’t important to me at all and I’m blissfully happy doing what I want when I want. Just me and my two cats. I’ve had loads of ‘rows’ with friends about this. They insist that I can’t spend Christmas Day alone. They never win. I tell them, with love, that surely it’s up to me how to make myself happy on Christmas Day – and being at home with my feet up watching TV, drinking champagne and eating far too much, makes me happy. We all chat on the phone during the day though, so I’m never totally on my own. I’m not sure I have one. I write full-time, so I get up (early) and, once I’ve fed the cats and made coffee, I start writing. Sometimes I answer emails and social media posts first, sometimes I write for a few hours and then check emails etc. I’ve usually got more than one book on the go, so I work on whichever one I feel like writing. I never plan my books. I’m a complete pantster. I simply sit and type whatever comes into my head, or the scene I see playing out in front of me and let my characters take me where they may. Sometimes they surprise me and do something I didn’t see coming, which changes the way I thought the story was going. I do a lot of research though, if a particular idea pops into my head, long before I sit down to write the story. Tell me about your journey to getting published. I have my own imprint and publish under that, by choice. I’ve never submitted to an agent or a ‘publisher’. I knew the route I wanted to go and I took it. I’ve been very lucky and successful and have actually rejected offers because, frankly, I earn far more being indie and can write what I want, when I want and I love the freedom of that. Although when one publisher, in particular, contacted me, I was tempted for a while because it seems, every author wants to be with them. But I realised I didn’t, so I said, ‘Thanks so much, but no thanks.’ Being indie works brilliantly for me and I can’t see that changing. However, I never say, ‘No, never’, until I see what’s on offer. It takes over my life. I mean, completely takes it over. I can sit at my desk for days on end with only a few hours break for sleeping and eating (and stroking my cats) and I don’t know what day it is. Thankfully, I have very understanding friends. The way it takes over my life. I become part of the story. It’s as if I’m there with my characters, seeing what they see, doing what they do, feeling what they feel. They become ‘real’ people to me and when I finish a book, it feels as if I’m saying goodbye to good friends as I wish them well and send them on their way. They also surprise me sometimes – which I love. That’s a difficult question for me to answer because, I suppose, every author inspires me. It takes a lot to write a book. The author/writer/superstar I most admire though is Nora Ephron. And I love her films. She was an amazing woman. I’d started a new series for next year, which was going to be 4 books, but I had an astonishing amount of emails and messages asking me to write more books in my Lily Pond Lane series, so that’s what I’m working on now. Lonely Planet – British Columbia and Canadian Rockies travel guide. I was hoping to go this year but life got in the way. I’m now planning a trip for next year. We’ll see what happens. What’s your all-time favourite festive book? I love skiing but, due to health problems, haven’t been for several years. I watch anything skiing related though and hope to go again one day. I swim, spend time with my friends, potter in the garden, and plan new trips I may never take. I love travelling but again, due to health issues, haven’t been away for a few years. I draw and paint (not very well) and I spend hours on Photoshop drawing and designing. I’m a huge fan of Adobe Creative Cloud. 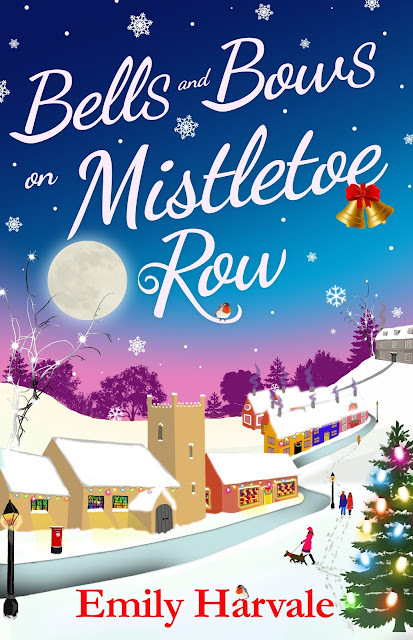 Bells and Bows on Mistletoe Row is available to buy now. For more information about Emily and her writing, head on over to her website. What's your favourite Christmas book? Let me know in the comments below!